Macie is very excited and happy to be a new student (4th grade) at The Country School. She was nervous on her first day of school, but came home with a big smile. Her classmates and teacher are very friendly and helpful, and make Macie feel welcomed. Macie is excited to go to school in the mornings! She loves playing on the tire swing on the playground, and she loves Art and Spanish. Outside of school, Macie’s favorite hobby is horseback riding and several of the girls in her class have a love for riding as well. She’s very happy to have friends with the same interests and hobbies. Macie also plays field hockey and her team is currently undefeated. 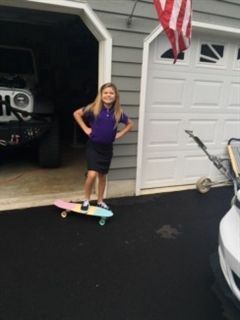 As a family, we have been excited to watch Macie transition into a new environment so effortlessly and are very thankful for the support we have found with the faculty and other Country School parents.